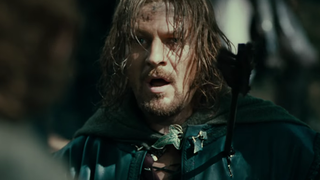 So, Sean Bean dies a lot, right? You've seen the supercuts. We all assume the moment he's cast in something, the poor guy he's playing will get offed at some point. But does Sean Bean really always die? Has he even died the most? Good job Nerdist's Kyle Hill is here with a chart to help us. As you can see, while Bean is up there with onscreen deaths, he's trumped by 3 actors - Vincent Price, Bela Lugosi and the War Doctor himself, John Hurt, who's popped his clogs 43 times during his esteemed career. Does his regeneration at the end of The Day of the Doctor count in that figure? But the chart doesn't tell us everything - of course, the longer an actor's career, the more likely they're going to have come character deaths. John Hurt might simply have such a high number of deaths because he's been acting for 52 years. When Hill totted up a Deaths/film ratio for his actors, he found that yes, Bean does come out on top, with a 0.32 Deaths Per Film, tying him with Bela Lugosi, while Hurt dips down to 0.31. Still, I bet just under a third of his appearances being fatal is a lot less that most people thought.